My name is Jack Brown and I’m based at the Policy Institute at King’s, King’s College London. I am the first ‘Researcher in Residence’ at No. 10 Downing Street. As part of my role this year, I am investigating the ‘Geography of Power’ at the centre of British government, and the important two-way relationship between No. 10 as a building and those that work and live within it. This is the first in a series of four posts reporting on some of my early findings as Researcher in Residence. I began my research by examining the history of the re-planning and rebuilding of Nos. 10, 11 and 12 Downing Street, led by architect Raymond Erith and the Ministry of Works, between 1957-63. These blogs tell the story of a unique opportunity to rethink and change No. 10 forever, and of how competing interests and differing visions of what might be best for the building eventually led to the Downing Street of today. This first blog provides the historical background to the rebuilding, with more to come in future blog entries on the major planning decisions themselves, the Prime Minister’s repeated attempts to intervene and change No. 10 significantly, and the difficult rebuilding works that followed. This series will be accompanied by further updates on the work of No. 10 Downing Street’s first Researcher in Residence throughout the rest of the year, and is part of the research for an upcoming book on the ‘Geography of Power at No. 10 Downing Street’, to be published in 2017. No. 10 Downing Street has shaped the activities of its occupants similarly, and yet only once in recent history has the design and layout of the Downing Street houses been seriously reconsidered. This occurred during Harold Macmillan’s premiership, between 1957-63, when No. 10 was re-designed, vacated and rebuilt, alongside Nos. 11 and 12 and part of the adjacent Old Treasury building (now home to the Cabinet Office). This fact, alongside No.10 staff’s assistance in helping me track down the personal archives of Raymond Erith, the architect who led the redesign, at the Royal Institute of British Architects, means that this is the perfect place to begin an investigation into the historical ‘Geography of Power’ at Downing Street. No. 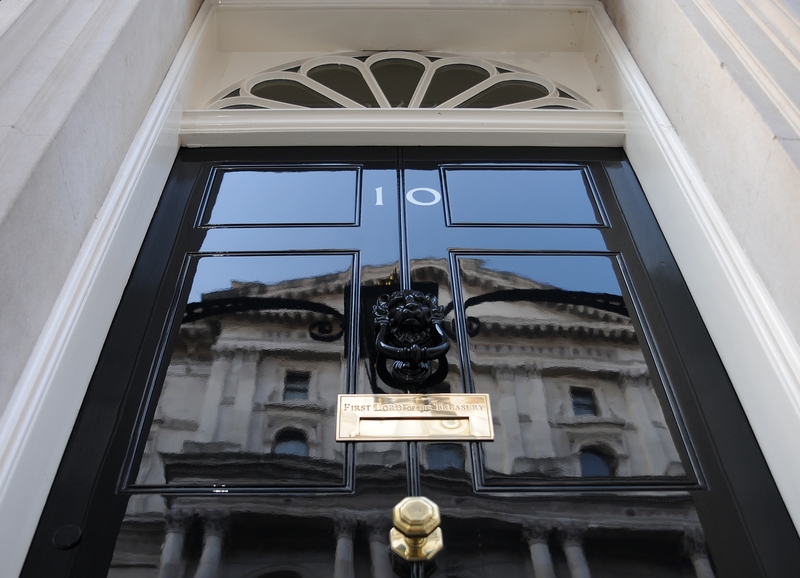 10 Downing Street is a house with a long and fascinating history which strikes you as soon as you enter the iconic front door. The scene of hundreds of years of top-level decision-making, it is also the product of hundreds of years of incremental adaptations, repairs and restorations. It has proved remarkably resilient in providing a working environment for those who hold, and those who support, the most life-consuming, most powerful and most sought-after job in British politics. However, much about No. 10 is the product of historical chance, rather than design. Over hundreds of years, the responsibilities that fall upon the shoulders of those who hold the office of Prime Minister have evolved, and, whilst the number of staff, advisers and assistants working in No. 10 still remains very small when compared internationally, this number has increased over the centuries. The layout and facilities of the labyrinthine 17th century building that houses the Prime Minister and their staff have, however, remained essentially the same. The nature of the building has certainly acted as a restraining factor on the growth of staffing numbers, and has dictated and limited who has direct access to the Prime Minister. In this sense, the building itself has played an important role in shaping the conduct of government at the very centre. As bizarre as it may seem, No. 10 has changed surprisingly little since it was constructed in the late seventeenth and early eighteenth centuries. Ever since then, as Churchill observed, the building has been shaping those who live and work within it. The scene of many a pivotal moment in British history, No. 10 Downing Street generally performs three main functions: as a 24-hour office for the Prime Minister and his or her staff; as a home for the Prime Minister and his or her family (although neither are obliged or required to live at No. 10, and some have chosen not to); and as a venue for hosting functions and entertaining a broad range of guests, both national and international. The houses at Downing Street were originally constructed in the 1680s, and the process of adapting them for their new purpose began almost immediately. Whilst Nos. 10, 11 and 12 appear as a row of modest, terraced houses when viewed from Downing Street, No. 10 is larger than it first appears, being connected to a ‘house at the back’ and renovated in preparation for the first Prime Minister Sir Robert Walpole’s arrival in 1735. From above, No. 10 looks like an offset square, sticking out to the rear at the end of the south-facing terrace of houses that includes Nos. 11 and 12, with the two buildings that now make up No. 10 joined together around a central courtyard. From inside, it is easy to become disorientated in No. 10’s endless corridors and ad hoc rooms. Ministry of Works files held at the National Archives record that, within thirty years of the first Prime Minister moving into Downing Street, the buildings were already being described as ‘old’ and ‘much decayed’. [ii] Work by prominent architects including William Kent and Sir John Soane in the 18th and 19th centuries was accompanied by numerous major expenditures on repairs and rebuilding, including over £11,000 of works in the ‘Great Repair’ of the late 1700s, (a sizeable sum for the time and twice as much as the initial estimate), and modifications such as the installation of electric light in 1894. [iii] The majority of these works, performed on a house that was originally constructed cheaply and on marshy land, would prove more expensive than expected, and repeatedly failed to address No. 10’s structural issues. No. 10 survived the bombing of London during the Second World War, although multiple near misses in 1941 saw windows blown out and internal damage to many of the building’s rooms. The somewhat shaky Downing Street buildings were thought unsafe, and Prime Minister Winston Churchill was reluctantly moved into the more sturdy No. 10 ‘Annexe’, beneath GOGGS (Government Offices Great George Street, which is today occupied by the Treasury) and above the Central War Rooms, just a few months after becoming Prime Minister. However, Churchill occasionally still used the Cabinet Room, and returned regularly throughout the war to dine in the reinforced and converted ‘Garden Rooms’ in the basement of No. 10, where he was joined on several occasions by King George VI. To this day, a plaque in the Garden Rooms proudly commemorates this fact. [iv] Yet despite surviving the war, No. 10 as a building did not thrive in the postwar years. Wartime bomb damage only added to existing structural issues, and, come the postwar years, No. 10 Downing Street’s future was uncertain. These arguments ultimately won the day, although it would take two further Prime Ministers before any action was to be taken. When the Ministry of Works’ report on the Downing Street houses was considered in Cabinet on 21st June 1955, Prime Minister Winston Churchill and his Chancellor of the Exchequer Rab Butler both accepted the need to proceed with detailed plans for the rebuilding of Downing Street, but pushed the works out until the middle of 1958. [ix] That substantial rebuilding would require both figures, their families and their private offices to move out of Downing Street and into temporary accommodation for the duration of the works, which would take several years, is likely to have played a part in the decision to postpone as long as possible. This disruption was one of several factors that made the work very unappealing. Winston Churchill’s reunion with Downing Street upon the advent of his second premiership (1951-55) was a joyous one, described by his daughter Lady Soames as ‘like a bird returning to its nest.’[x] Coupled with the fact that the two-time Prime Minister was now ‘gloriously unfit for office’ for much of his second premiership, to use Roy Jenkins’ wonderful phrase,[xi] preferring to work from bed throughout much of it, it is perhaps unsurprising that the major disruption to life at No. 10 was passed over for one of Churchill’s predecessors to accommodate. After Anthony Eden’s brief premiership ended shortly after the Suez Canal crisis of late 1956, the responsibility was passed on to Harold Macmillan, Prime Minister from 1957-1963. This series of blogs are part of a wider research project on the post-war ‘Geography of Power’ at No.10 Downing Street, to be published in 2017. This blog series consults a range of sources, including the following: the personal files of Raymond Erith, held at the Royal Institute of British Architects; the WORKS, CAB and PREM files at the National Archives; Hansard; No.10 History website; C. Jones, No. 10 Downing Street: The Story of a House (London: BBC Books, 1985); R. J. Minney, No. 10 Downing Street: A House in History (Boston: Little Brown & Co., 1963); A. Seldon, 10 Downing Street: The Illustrated History (London: HarperCollins Illustrated, 1999); H. Wilson, A Prime Minister on Prime Ministers (London: Weidenfeld & Nicholson, 1977). Very interesting article. As an American with an interest in British history, particularly politics and government, I've always wondered how the PM could function in such a small place compared to the White House. Articles like this one are most enlightening. One can barely imagine the story that would be told of the Palace of Westminster.